It’s been said that layer cakes may be one of the food trends in 2012 and with that in mind Anna at Cookie Madness put together a list of favorite layer cakes, and provided a link to another list of her favorite chocolate cakes. Her list is better than any magazine spread I’ve seen in awhile. 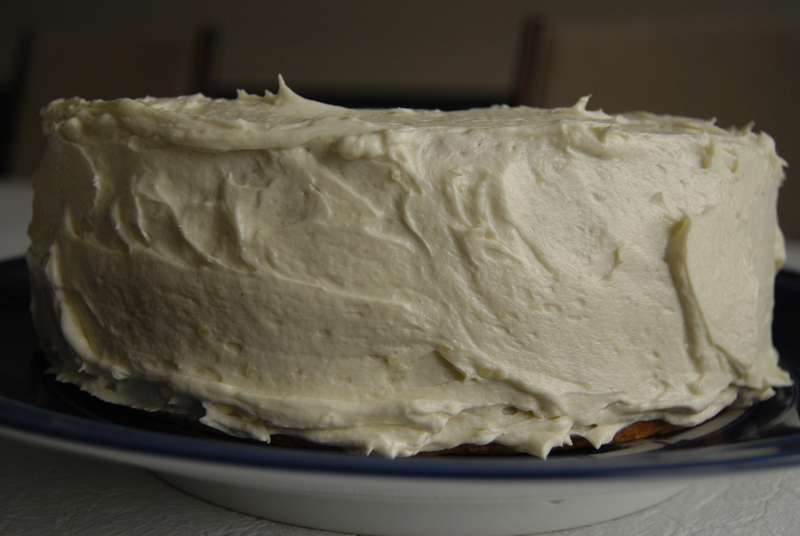 With all of that layer cake love and inspiration I realized that I could make a layer cake a month in 2012 without making the same cake twice! 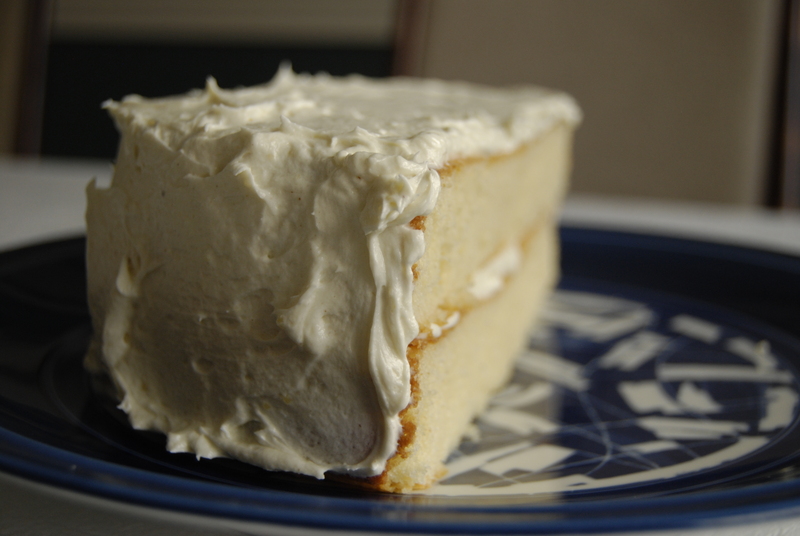 There is a cake on that list that I can’t wait to get to, but with some eggnog in the refrigerator needing to be used up I decided to start with the eggnog cake. I buy organic eggnog to make cinnamon eggnog scones at Christmas time. I love those scones! The only problem is that no one in my family likes to drink eggnog and I always end up with leftovers that most often get thrown out. We like the flavor but the glugginess is a turn off. So on New Year’s day after a week plus of eating too much sugar and eating too much in general there I was in my kitchen making cake! I only had enough eggnog to make a half recipe and I only own nine inch round pans so I made one layer of cake, cut it in half and layered it. We like this cake quite a bit. It has a slightly course texture, but is moist without being wet. It’s very easy to make. We both liked it on day one but we like it even better on day two. The nutmeg and eggnog make this cake very flavorful and will be enjoyed by anyone who likes those flavors. The frosting is that old fashioned frosting where you make a roux and then incorporate it into a creamed butter and sugar mixture. It sounds funky but is actually quite good and a good technique for making frosting when you realize you don’t have any powdered sugar in the pantry. There is a chance that the roux will have lumps in it, but I didn’t have any problems with lumps using the microwave method and the frosting was super smooth. I’m retyping the recipe in the half batch version and including instructions for making the roux in the microwave. For the full version and stovetop instructions for making the roux you will find the recipe here. Preheat oven to 350 degrees F. Spray one 8 or 9 inch round metal cake pan with cooking spray and coat with flour. In a mixing bowl, stir together flour, sugar, baking powder, salt and nutmeg. Add softened butter and stir it in, mashing it into the dry ingredients and coating them with butter. When the mixture is moist with butter, add the eggs, vanilla and eggnog. With a spoon or lowest speed of electric mixer, beat until mixed. Turn speed to medium high and blend for about a minute. Pour batter into cake pans, dividing evenly. Bake for 28 to 30 minutes or until cake springs back when lightly touched. Cool in pan on rack for 10 minutes. Flip and cool completely. In a microwave bowl, whisk together flour and salt and about 2 T. of the eggnog. Continue adding the egg nog 2 T. at a time and whisk each addition until all lumps disappear. Microwave on 50% power for 2 minutes stirring once. Remove from microwave and whisk again. I didn’t have any lumps. In a mixing bowl, beat butter and sugar until creamy. Add flour mixture and continue beating on high with an electric mixer for about 8 minutes or until the sugar is dissolved and the icing isn’t grainy. (It only took me 5-6 minutes to get to the non grainy stage. Beat in the vanilla. Ice the cake. Instead of replacing the photo in the previous post I decided to put new photos in a new post. The photos aren’t that much better but they’re enough better to share. As usual the photos don’t do these justice. The brownies were great yesterday. They’re even better today. Much like the way cheesecake is better on Day 2. The cheesecake part is smoother. If you haven’t made these and you’re looking for a recipe, make these. You’ll find a link to the recipe in the previous post. When I was in third grade my classmates and I all contributed a recipe to a recipe booklet that we made for our Mom’s for Mother’s Day. Our teacher apparently rewrote the recipes we submitted onto mimeograph paper and made copies of the recipes for us to bind together between construction paper covers that we decorated with Crayons. I’m pretty sure my front cover was originally pink and my back cover was purple. When I was home visiting my parents my mother gave me the one I made knowing I would get a kick out of it, and I did! The recipes include one recipe for chili, and all the rest are for baked goods. The baked goods span everything from cookies, cakes, pies, bread and desserts. It’s a real treasure trove! The recipe I submitted was for Butterscotch Pie. My Mom and I both found this interesting because neither of us remembers being smitten with Butterscotch Pie. I guess it just sounded good to my third grade brain. Anna at Cookie Madness recently made a few Butterscotch Pies and came up with a winner. Her post is what jogged my memory about butterscotch pie. But, before I made hers I had to do a spin on this one. This recipe calls for a seven inch pie plate which I don’t own, so I made two little pies in my beautiful single serving Emile Henry Pie Dishes. I made some major changes in putting this together, but for the filling I used the same proportions of ingredients. I think you’ll be able to read the recipe as I submitted it in the photo, but I’ll type it up the way I made it today. I used the microwave for the filling. The recipe didn’t state what type of crust to use. I wasn’t in the mood for roll out pie pastry so I took a short cut and opted for a graham cracker crust. I made the simplest of all meringue toppings. The kind we would have made way back when I was in third grade. We haven’t tasted the pie yet. I’ll let you know what we think of it. For the crust: Combine 1 c. crushed graham crackers, 1 T. sugar and 3 T. butter. Divide evenly between two mini pie dishes and bake for 8 minutes. Place the pecans on top of the pie crust. Combine brown sugar, flour, butter and salt in a 4 c. Pyrex measuring cup and microwave on high for 30 seconds. Stir until well combined. Add the milk and whisk together. Microwave on high for 1 minute. Whisk well. Microwave for 3 minutes and whisk again. Whisk the three egg yolks. Add a small amount of hot milk mixture to the egg yolk and whisk well. While whisking, add the egg yolk mixture back into the hot milk mixture. Microwave for one more minute whisking at 15 second intervals. The mixture should mound slightly when drizzled from the end of the whisk. Stir in the vanilla. Pour the mixture into the hot pie crust. Combine the egg whites and the salt and mix on high speed with hand mixer until soft peaks form. Add the sugar 2 tablespoons at a time until the sugar is dissolved and stiff peaks form. Place on top of the hot filling and Bake at 350 degrees for 10 minutes. We tasted the pie after dinner this evening. It’s very tasty. I’m glad I put in the toasted pecans because they temper the sweetness a little. I would make this recipe again. It set up nicely, and didn’t run at all. My husband tells me that Butterscotch Pie is his Dad’s favorite. I had no idea! I’ll definitely have to make the full size version for him someday. I wish I could remember how I stumbled upon this recipe at Colleen’s Cookbook. I’m thankful for whatever I searched for or clicked on to take me there. This is a good chocolate cookie recipe and I love the M&M Mint Chocolate Candies that go into them. They’re a little larger than standard M&M’s, and the shell is a little thicker. My husband and I had a hard time leaving them alone as I was mixing up these cookies. The ratio of candies to cookie dough is very high, but I wouldn’t change that. The mint flavor from the candy is just right and I love the crunch the thick shells bring to the cookie. Colleen’s recipe called for pecans. I omitted them. I rarely retype recipes that appear elsewhere on the web, but since I weighed my ingredients and think you might find that helpful I’ll jot it down here. Colleen attributes this recipe to M&M’s but I couldn’t find it on their site, and I accidentally tossed the empty bags before comparing this recipe to the one on the back of the bag. If memory serves me right, I don’t think it’s there. I think the recipe on the back of the bag right now is for a decorative baking use of the candy. Whisk together four, soda, salt and cocoa in a small bowl. In a large bowl cream the butter and sugar. Add eggs one at a time, until thoroughly mixed. Stir in the flour mixture 1/2 c. at a time. Stir in the all but one cup of the candy. Drop by large tablespoons, at least 2 inches apart, onto the parchment paper. Before baking place a few of the reserved M&M’s on the top of each cookie. Bake for 12-15 minutes. Basically Baked turns one year old today! I’ve enjoyed connecting with those of you who take the time to leave a comment and I enjoy visiting the blogs of those of you who author them. To celebrate the anniversary I made the Chocolate Bon Bon Drops that Mary Jane Robbins recently blogged about on the King Arthur Baker’s Banter Blog. They’re very easy to make, very tasty and have a festive look to them. You’ll find the recipe here. The only change I made to the cookies is to garnish them with Holiday M&M’s instead of the pretty chocolate pearls from King Arthur Flour. I don’t own a tiny teaspoon cookie scoop so when I was done mixing the dough I divided the dough into two equal portions, flattened each portion into a 4 x 3 inch rectangle and then wrapped each rectangle in it’s own piece of waxed paper and refrigerated it for about an hour. Then I cut each rectangle into twelve pieces and formed the pieces into balls and baked according to the directions. The cookies are sort of a chocolate shortbread. I made my glaze with half and half instead of cream and I would have to agree with Mary Jane that the half and half yielded a thinner glaze than might have been desirable. I also thought the glaze was very good but it was very sweet. The cookies are good enough that I don’t think they need the glaze except for the decorative effect. I think some decorative stencils and powdered sugar might yield a pretty cookie and keep the focus on the cookie. 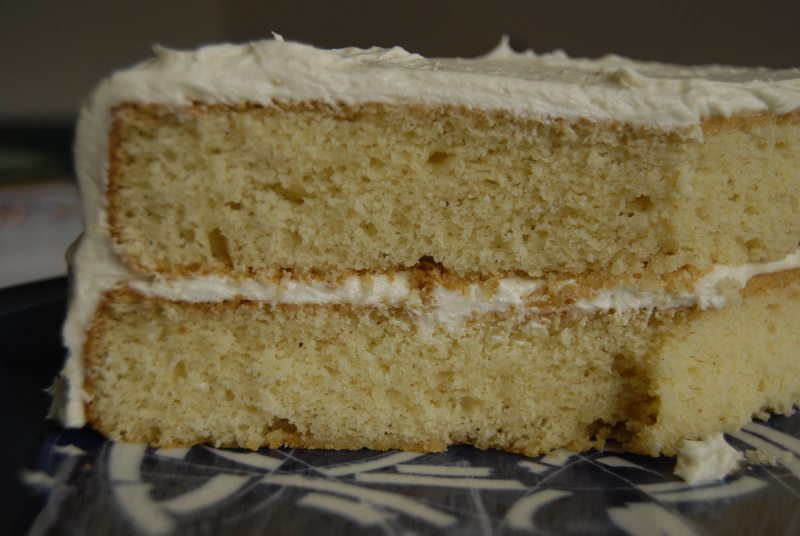 By the way… those flecks you see in the glaze are from vanilla bean paste. Good stuff! !